There are many proxy sites, which let you disable JS while browsing. All you need to use those proxy sites, which offer such features and you can quickly use right-click on click disabled sites. And find the paragraph or text you want to copy and then paste it into any text editor. Well, using this trick ethically or unethically is in user hand but for a normal blogger like me and you, this tip will certainly help. Do you use any other plugin or add-on to copy content of pages with right click disabled? Do you also see this feature as bad user experience? Here’s the deal: If you make an encrypted backup of your old iPhone using iTunes, then restore it to your new iPhone, it’ll bring most — if not all — your password information along with it. That’ll save you a lot of time and effort getting set back up. You do need a Lightning to USB cable (or 30-pin Dock to USB if you have an iPhone 4s or earlier), and you’ll still have to re-download apps — the App Store gives you slightly different versions for each device, optimized to run best on that specific hardware — but overall I still find it to be much, much faster. Make sure you’re running the most recent version of iTunes. Plug your old iPhone into your Mac or Windows PC. Click on Encrypt Backup and add a password. Turn off your old iPhone. On iTunes on your Mac or Windows PC, select Restore from this backup. Choose your recent backup from the list. Enter your password if your backup was encrypted and it asks. Take your SIM card out of your old iPhone. (If you don’t have a new or separate SIM card for your new phone.) Wait for the backup to complete before proceeding. Plug your new iPhone into your Mac or Windows PC. Keep your iPhone plugged into iTunes until the transfer is complete, and on Wi-Fi until all re-downloads are complete. Depending on how much data you have to re-download, including music and apps, it might take a while.Your iPhone might feel warm or even hot, and you might burn a lot of battery life for the first few hours or even a day or due to the radios working and the Spotlight search system indexing. Just let it finish. The battery life of an Apple MacBook is something that PC laptop users dream about. 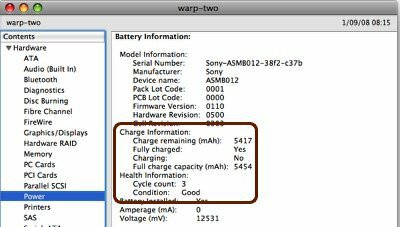 It’s normal for MacBook Air users to get 12 hours on a single charge, and MacBook Pro users should get several hours, even if the laptop is a few years old. But, the battery life will get worse over time. There is nothing that anybody can do to prevent that. The issue comes when it is time to replace the battery. They are not designed to be replaceable by members of the public, which makes some people think that they are not replaceable at all. That’s not true. The battery in a MacBook, whether it’s a MacBook Pro or Air, can be replaced with a new model and many more years use can be had. The fastest way to check if your MacBook is in need of a new battery is to open System Profiler. This is located in Applications > Utilities and can also be accessed by going to the Apple menu > About This Mac > More Info. Click on the Power section in the list and you’ll find information like the cycle count and condition rating. The condition rating can be “Normal”, “Replace Soon”, “Replace Now”, or “Service Battery”. If your battery is listed as anything except, Condition: Normal, then you should replace your battery. OS X Snow Leopard v10.6.8 or earlier: Open Apple System Profiler by choosing “About this Mac” from the Apple Menu. Then, click More Info. OS X Lion v10.7 or later: Open System Information by choosing “About this Mac” from the Apple Menu. Click System Report. Click Power in the Contents list (under the Hardware section as shown below). Use of your MacBook battery is counted in the form of charge cycles. A charge cycle means using all of the battery’s power, but that doesn’t necessarily mean a single charge. For instance, you could use your MacBook for an hour or more one day, using half its charge, and then recharge it fully. If you did the same thing the next day, it would count as one charge cycle, not two, so it may take several days to complete a cycle. Batteries have a limited amount of charge cycles before they are considered to be consumed. Once consumed, a replacement battery is recommended. You can use your battery after it reaches its maximum cycle count, but you may notice a reduction in your battery life. Knowing how many charge cycles are on your battery and how many are left can help you determine when a battery replacement is required. For optimal performance, replace your battery before you reach the maximum cycle count.